Bitcoin prices on an uptrendVenezuela is a prime example of why BTC is neededParticipation levels are high, poised to increase in coming daysAfter Feb 8 rockets, it is clear that momentum has shifted from bearish to bullish. Further padded by supportive fundamentals, it is likely that BTC will break and close above $3,800 ushering in a demand wave that would see prices retest $6,000.Bitcoin Price AnalysisFundamentalsThere is a crisis in Venezuela, and the government’s endless tussle is wrecking ordinary Venezuelans. To quantify how nerve-wracking it has been for Bolivar dominated investments, if you had $1 million worth of Bolivar before the super hyperinflation, that value would be worth $3.4.That’s how grim the situation is and dark days are expected because of a political standoff. Maduro is clinching to power as the US and allies support the opposition leader. It doesn’t matter. There are no winners. The ones that stand to benefit are those who shifted their wealth to a censorship-resistant, political resistant super currency Bitcoin.With no point of control, any Venezuelan who moved their stash to BTC before the value wiping inflation has more than quadrupled his holding and still enjoying the luxury of spending his “money” without fear of confiscation.Candlestick Arrangements From a top-down approach, BTC is trading within a bearish breakout pattern with resistance at $5,800–$6,000 zone.That is almost double the prices of spot rates and a rather ambitious target considering price dumps of the last 13 months. Even so, our previous BTC/USD price analysis is valid, and as long as there is confirmation of Feb 8 bull bar, odds are prices will surge above $3,800 as prices snap back to the trend set in motion by Dec 17.There are technical reasons backing our stand. 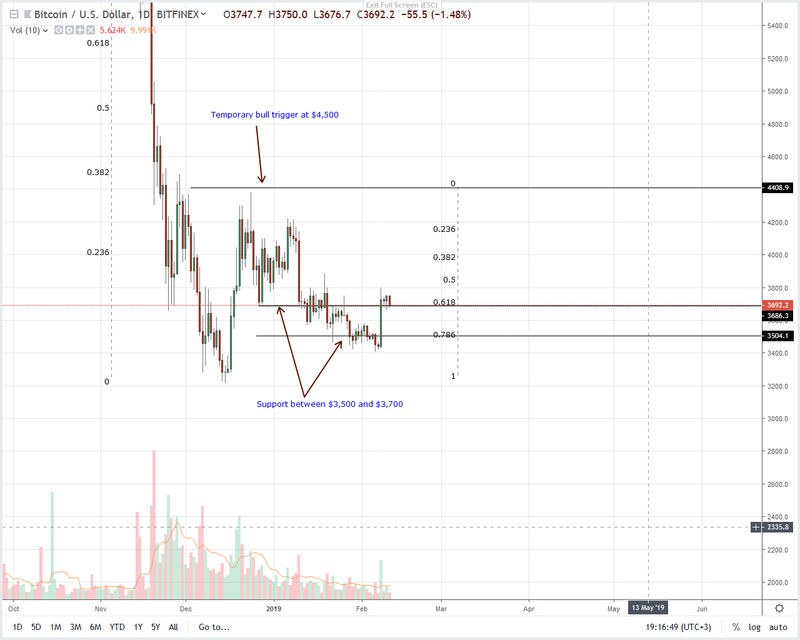 First, BTC has support at the 78.6 percent Fibonacci retracement level after correcting from Dec 2018 highs of $4,500. Secondly, following price springs of Feb 8, we now have a double bar bull reversal pattern complete with high trade volumes.Although there might be attempts to buy on dips, it’s preferable to wait for satisfactory breakouts. That will only happen once prices close above $3,800 as laid out in previous BTC/USD trade plans.Technical IndicatorsPropelling prices from $3,400-500 zone were high volumes exceeding those of Jan 28—17k and those of Jan 20 of 20k. However, Feb 8 volumes were lower than that of Jan 10. All the same, at 31k, it surpassed previous averages of 11k. As a result of this, it is likely that bulls are back and all we need is a close above $3,800 as bulls reaffirm Feb 8 bull bar.